In politics, the people who really know you are your friends and neighbors. At this stage in the election cycle, many Democratic presidential candidates have low name recognition nationally, which means that their popularity at home might be one way to help us understand whether they can appeal to a larger, national audience. Or if they should consider not running. To figure out how politicians’ constituents feel about them, we looked at two measures. The first is how popular they were among Democratic voters in their home states, which might be an indicator of their ability to attract support in their party’s presidential primary. The second is how popular they were among all voters in their states compared with the states’ partisan tendencies, which might give us a sense of how effectively the candidates can appeal to the broader general electorate. When it comes to appealing to both the party and the broader public, Bernie Sanders and Amy Klobuchar get strong marks in their home states. While this doesn’t necessarily mean either will be the Democratic nominee in 2020 — Vermont and Minnesota are not the same as the U.S., of course — it does offer evidence of their potential, particularly for the relatively unknown Klobuchar. Let’s start with approval ratings among Democrats in the table below, where these two senators lead the way. Among candidates who have declared they are running and who are included in Morning Consult’s approval polls of senators and governors. In the table above, 2020 hopefuls are ranked by their net job approval rating (approval rating minus disapproval rating) among Democrats in their state. The data was collected by Morning Consult in the last quarter of 2018; every quarter, the pollster reaches out to hundreds of thousands of people to create its rankings of “America’s most and least popular” senators and governors. Of course, not all the declared Democratic presidential candidates were either a senator or a governor in the closing months of last year, which means that a few hopefuls have been left out, including former San Antonio Mayor Julian Castro and U.S. Rep. Tulsi Gabbard of Hawaii. Sanders and Klobuchar scored these high marks among Democrats in their home states while also being the best-known — based on the share of people who were able to form an opinion of them (approval rating plus disapproval rating). Notably, despite being so well-known, both Sanders and Klobuchar had disapproval ratings below 10 percent among Democrats, unlike the other six contenders. Sanders is already well-known nationally from his 2016 presidential bid, but that he remains beloved by Vermont Democrats — even as he has technically served as an independent — suggests that he hasn’t lost ground despite continuing to turn his gaze toward national politics. As for Klobuchar, she doesn’t have Sanders’s national profile, and only 2 percent or 3 percent of Democratic voters named her as their pick in the latest polls of the primaries. Yet, her net approval rating among Minnesota Democrats of +81.3 percentage points is nearly as high as Sanders’s (she easily won all three of her Senate races even though Minnesota is not nearly as blue as Vermont). So we shouldn’t underestimate her ability to make inroads among Democrats around the country once she becomes better-known. The remaining candidates — except for Sen. Elizabeth Warren, whom we’ll talk about in a minute — had net approval ratings between +54 and +60 points. That suggests that they’re relatively popular among their party bases but not as overwhelmingly popular as Sanders and Klobuchar. Part of that may be because most of them simply aren’t as well-known among their own constituents. Each of these candidates will be working to raise their profiles nationally in the coming months, but support at home could benefit at least one of them in a relatively early primary contest: California has more delegates available than any other state, and Sen. Kamala Harris is very popular there, and already leading in at least one poll. While home-state popularity within the party may indicate strength in the primaries, winning the general election requires broader appeal. So we also looked at candidates’ approval ratings among all voters and how those numbers compare to the partisan lean of their states.1 This shows us how much more or less popular a candidate is than we might expect based on the political makeup of their state. Along with former Colorado Gov. John Hickenlooper, Klobuchar and Sanders again led the way, as you can see in the table below. Because Minnesota is a purple state, its electorate includes a higher percentage of Republicans and independents than heavily Democratic Vermont’s does, so Klobuchar has more non-Democrats available to win over than someone like Sanders, which may make it easier for her to top this particular ranking. But the fact that her overall net approval rating far exceeds Minnesota’s slight Democratic lean shows that she is successfully appealing to voters outside her base. The same could be said of Hickenlooper. Democratic candidates who are able to appeal to independents and Republicans in purple states might be better able to win over the same types of voters around the country, having had to win some of those voters to get elected in the first place. Who’s getting more home-state support than their party? FiveThirtyEight’s partisan lean metric is the average difference between how a state votes and how the country votes overall, where 2016 presidential election results are weighted 50 percent, 2012 presidential election results are weighted 25 percent and results from elections for the state legislature are weighted 25 percent. Hickenlooper’s situation is particularly interesting because even though he ranked lower in net approval rating among home-state Democratic voters, his net approval rating among Colorado voters overall was strong, especially relative to the partisan lean of Colorado, which is a highly competitive state. Of the eight Democratic presidential candidates we’re looking at, Hickenlooper had the best net rating (-17.1 points) among Republicans in his home state. This might not bolster Hickenlooper’s appeal to the left wing of the Democratic Party nationally, but he could perhaps use those numbers to argue that he has the potential to broadly appeal to a general electorate and even chip away at the small share of Republicans who may be willing to oppose President Trump. Warren stands out here. Although the senator had a strong net approval rating among Democrats in her home state in the first table above, her net approval rating among Massachusetts voters overall is weak relative to how Democratic her state leans. (She also underperformed her state’s partisan lean in her re-election victory last year.) That’s because her net approval ratings among home-state independents (-0.3 points) and Republicans (-61.4 points) were the worst among the eight candidates we’re examining here. That could be a sign that Warren will encounter problems when trying to appeal to the broader electorate. Maybe it’s not surprising then that in a recent Gallup poll of U.S. adults, Warren had the highest unfavorable rating of the seven Democratic presidential candidates whom respondents were asked about. Although home-state approval ratings may not end up proving predictive of how the 2020 Democratic primary and general elections turn out, they may offer us some insight into the national candidacies of people who aren’t well-known across the country — like Klobuchar — or provide clues about the potential strengths or weaknesses of candidates who are more recognizable — like Warren. If the folks who know you best really like you or don’t like you as much as we’d expect, that might be a clue for how voters nationally will receive you. 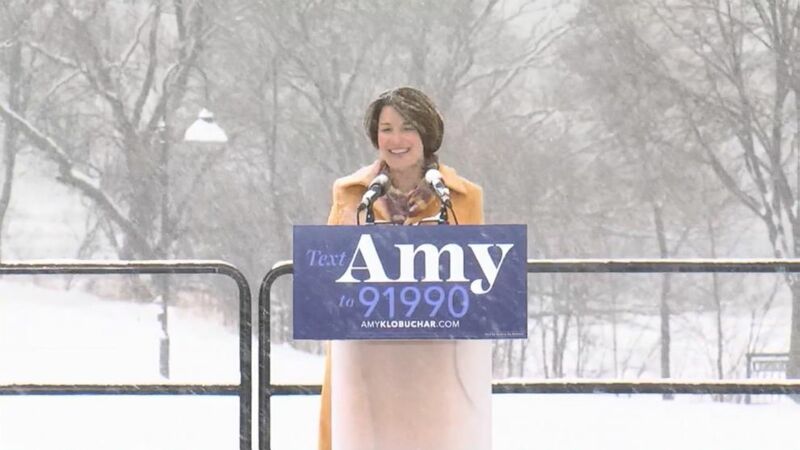 Minnesota Sen. Amy Klobuchar announced her candidacy for president at a rally in Minneapolis on Sunday, becoming the fifth Democratic senator1 to launch a campaign. In contrast to some of the big names — Kamala Harris, Cory Booker, Elizabeth Warren — who had been expected to run for president for years, Klobuchar is a little bit more of a homespun, independent-label candidate. What it means to be “electable” is somewhat in the eye of the beholder — the term sometimes seems to be a euphemism for a good-looking white guy who isn’t too liberal (hello, Beto). But Klobuchar can make some good, data-driven arguments for her electability. One of them is simply the overall electoral importance of the Midwest — particularly the Upper Midwestern states of Minnesota (which Trump came within 1.5 percentage points of winning), Wisconsin and Michigan (which Trump won). Winning those three states plus Pennsylvania (or Ohio, or Florida, or North Carolina) would have given Hillary Clinton the presidency. And if the midterm elections were any guide, they still probably represent the path of least resistance for Democrats to retake the White House. There’s also Klobuchar’s strong performances in Minnesota to consider. She was first elected in 2006 by a 20-point margin and then re-elected in 2012 by 35 points and in 2018 by 24 points. In each case, she performed well statewide and not just in the Twin Cities, winning 79 of 87 counties in 2006 and 85 of 87 in 2012. That declined to 51 of 87 counties in 2018, but given the massive swing toward Trump and Republicans in rural counties elsewhere in the Midwest, Klobuchar still did better than many Democrats. * In Vermont and Maine, the independent is treated as the Democrat. In California, the aggregate results for all Democratic candidates in the June 5, 2018, primary is used, since two Democrats advanced to the general election. However, in the Mississippi special election, the result of the Nov. 27 runoff is used since that race featured a Democrat against a Republican. Races with appointed incumbents — namely, the Minnesota and Mississippi special elections — are treated as open seats rather than as equivalent to races with elected incumbents. That rates as the third-strongest performance for a Democratic candidate for Senate last year, slightly behind West Virginia’s Joe Manchin and Vermont’s Bernie Sanders3 and just ahead of Texas’s Beto O’Rourke. Among other actual or potential Democratic candidates who ran Senate races in 2018, New York’s Kirsten GIllibrand also performs relatively well by this metric, whereas Ohio’s Sherrod Brown gets an average rating, and Massachusetts’s Warren a poor one. That’s not to say you should expect Klobuchar to tout her own electability on the campaign trail, which can seem uncouth. (The first rule of electability is: Don’t talk about electability.) But it’s an argument we’re liable to hear a lot from her surrogates. 2. Potential strength in Iowa, and in the debates. As compared to candidates such as Harris and O’Rourke, who might hope to blitz their way to victory on the basis of strong fundraising and early delegate accumulation in California and Texas, Klobuchar is probably playing a long game. But doing so requires hitting two important mile markers. First, success in the debates. And then a strong performance in the Iowa caucuses. Klobuchar’s team believes she should have two advantages in the debates. First, like Harris, Klobuchar is a former prosecutor — having been county attorney in Minneapolis’s Hennepin County — a skill that should translate well into the sharp-elbowed stage of the debates. And second, she can be candid and funny, potentially allowing her to surpass expectations among voters who expect Midwestern blandness or “Minnesota nice.” It’s a credible-enough case, but Klobuchar, who starts out with name recognition well below 50 percent, will need some big moments in the debates. Her potential to succeed in Iowa is more obvious. She will probably be the only major candidate in the race from a state that borders Iowa and one of relatively few Midwesterners in the field. And in her statewide races in Minnesota, she relied heavily on a retail approach to politics, something that should translate well to Iowa. Looking at past results from the Iowa caucuses makes it pretty clear that there’s a regional advantage in this contest, although other politicians who are not from the region but have strong retail skills (a description that might fit Booker and O’Rourke, for example) can also perform well there. Beyond Iowa, Klobuchar’s path is less clear. In New Hampshire’s open primary, voters typically favor liberal New Englanders such as Sanders and Warren.4 And the electorates get much less white after Iowa and New Hampshire, whereas Klobuchar’s strengths with nonwhite voters are less than obvious. So she’d be hoping for a polling bounce out of Iowa, something that used to occur regularly but has been more fleeting in recent years. 3. The beer track … without the baggage? Klobuchar’s campaign is likely to emphasize her working-class Midwestern roots, her staff said; you’ll hear stuff about how her grandfather worked as an iron-ore miner, for instance. It will also pitch her to voters on candor, honesty, pragmatism, an ability to “get stuff done,” work ethic and so forth. It’s going to lean pretty heavily into her Midwesternness, in other words. The idea is to draw a contrast — probably softly at first, and maybe more explicitly if the campaign grows more combative — between Klobuchar and more left-wing candidates from the coasts, particularly Harris, Warren, Sanders and perhaps Booker. In some ways, this will recall the old distinction between “beer-track” (“flyover-state” moderates) and “wine-track” (coastal liberals) Democrats. However, Klobuchar isn’t likely to have the beer track to herself; Ohio Sen. Sherrod Brown could be playing in the same lane, and, more significantly, so could former Vice President Joe Biden. There’s also what you might call a “craft-beer track,” consistenting of candidates who are from the middle of the country but whose appeal might be stronger among college-educated voters, such as O’Rourke and (craft brewery founder!) John Hickenlooper, a former governor of Colorado. Does that mean Klobuchar is liable to run explicitly as a moderate — campaigning, for instance, against policies such as “Medicare-for-all”? Her campaign wouldn’t quite say as much, instead describing her as a pragmatist and a realist — but that’s a fussy distinction at best. 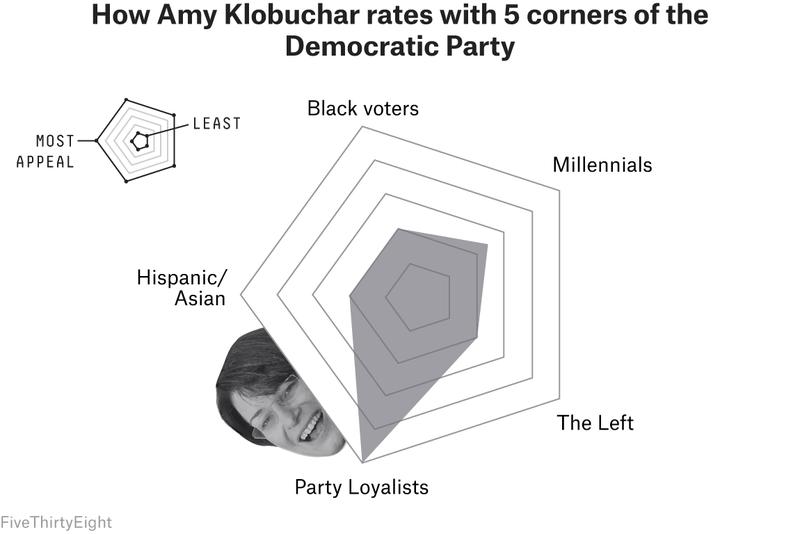 But there is an interesting twist to Klobuchar’s triangulation: Although she has a relatively moderate voting record, it’s fairly liberal relative to Minnesota, which (despite its reputation as a bastion of liberalism) is a purple state. Of the 13 Democrats who are either already running for president or are clearly telegraphing a run and who served in Congress during President Trump’s tenure, Klobuchar has the 12th-highest Trump score, meaning she’s voted with Trump comparatively often (31.5 percent of the time, trailing only former Maryland Rep. John Delaney among the presidential contenders). But she has the 10th-lowest Trump plus-minus rating, meaning that she’s voted with Trump much less often than you’d expect from someone from a purple state or district. Only Oregon’s Jeff Merkley, and Brown and Rep. Tim Ryan from increasingly red Ohio have a lower Trump plus-minus among the potential presidential candidates. By contrast, O’Rourke, although he voted with Trump slightly less often than Klobuchar, has the highest Trump plus-minus in the field because he represents an extremely blue district in El Paso. Trump score, predicted Trump score and Trump plus-minus for likely and declared Democratic candidates for president who have served in Congress under Trump. Klobuchar’s voting record is moderate relative to other Demoratic candidates for president but liberal relative to a purple state. Trump score indicates the share of votes for which the member voted in line with Trump’s position. The predicted score is what we expect that member’s score would be based on Trump’s 2016 margin in that member’s state or district. The Trump plus-minus is the difference between the actual and expected scores. Klobuchar also has some other arguments to make against the rest of the beer-track candidates. Or at least, she arguably has less baggage than the rest of them. Her credentials — 20 years in public office — are sound by presidential standards (unlike O’Rourke’s). She isn’t 76 years old, as Biden is, and she doesn’t represent a state that is heavily invested in the financial industry, which is a problem for Biden and for all of the New York and New Jersey Democrats. The beer track will likely also be dominated by men — including possible candidates Biden, O’Rourke, Brown, Hickenlooper, Ryan and Montana Gov. Steve Bullock — so Klobuchar could have a lot of strength with working-class women, an overlooked and important part of the Democratic base. Of course, it’s also possible that the beer track is a road to nowhere. Democratic delegate allocations are based on the number of Democratic votes for president in each state, which means they’re deliberately biased toward blue states. And an increasing number of Democrats view themselves as liberal rather than moderate. 4. A reasonably clear contrast to Trump. Before I started researching and reporting out this story, I thought one Klobuchar strength was that she could formulate one of the clearest contrasts to Trump. It’s almost always helpful for candidates in the primaries to draw stylistic and substantive contrasts against the other party’s president, as Trump did against Barack Obama, as Obama did against George W. Bush, and as Bill Clinton did against George H.W. Bush. My thinking was that Klobuchar’s mild-mannered Minnesota-niceness and long career as a public servant — and the fact that she’s a woman — would look to Democratic voters like the antidote to Trump’s bombast and braggadocio. I still think that theory is mostly true and that Klobuchar is an above-average Democrat in her degree of not-Trumpness. But I want to hedge against it a little bit. The version of Klobuchar we see in debates and on the campaign trail may be scrappier, blunter, more sarcastic and more emotive than people are expecting (and reports of angry and abusive behavior toward staffers may facilitate those perceptions). Moreover, to the extent that her campaign is drawing distinctions between her beer-track persona and the wine-track elites from the coasts, she’ll in some ways be echoing arguments that Trump might make about Democrats. Overall, this is an impressive list of strengths, even if some of them are quite hedged. They’re why Klobuchar has a considerably better chance of winning the nomination than you might guess given her relatively low profile. But she also has a couple of significant weaknesses. 1. Lack of a clear path with nonwhite voters. Minnesota is not quite as white as you might think. It’s home to several immigrant groups, including some relatively smaller ones such as Somalians and Laotians. And its nonwhite population has grown significantly since 2000. Nonetheless, as of 2017, about 80 percent of Minnesota’s population was non-Hispanic white, compared with 61 percent for the U.S. as a whole. And since many of those nonwhite Minnesotans are recent immigrants, the share of whites among the electorate is even higher, at about 89 percent. That’s not to say that white politicians can never find appeal with nonwhite voters. John Kerry did quite well with African-Americans, for instance, and O’Rourke was elected to Congress three times from one of the most Hispanic congressional districts in the country. This year’s Democratic field features several people of color, however, and Klobuchar doesn’t have any obvious strategy to appeal to black, Hispanic and Asian voters, which together will make up around 40 percent of the Democratic primary electorate. Instead, several of her likely strategic choices — running on the beer track, heavily investing in Iowa and (perhaps) New Hampshire — would emphasize trying to capture as much of the white vote as possible before turning to minorities. The five corners don’t capture everything. In particular, they don’t account for voters’ gender, even though around three-fifths of the Democratic electorate will be women. But it does mean that Klobuchar’s campaign will need to proceed in stages, without necessarily having a lot of margin for error. First, she’ll have to perform well in debates and town halls to boost her name recognition. Second, she’ll need to win Iowa — or at least beat expectations there — to vault herself ahead of the other beer-track candidates. Third, she’ll need to heavily emphasize electability to win the slugfest against the wine-track candidates. Each stage holds risks for Klobuchar, and she doesn’t have a lot of shortcuts or detours at any point along the route if she gets knocked off track. 2. Staffing a campaign and building support among insiders. Articles published by HuffPost and BuzzFeed News have included allegations of abusive behavior by Klobuchar toward her staff, citing both statistics showing her high turnover and heretofore largely anonymous accounts of bad behavior from former staffers. They also reek of inside-baseballness. Having a reputation as a bad boss can be problematic within your industry. But without salacious details, it’s not the sort of scandal that voters are liable to care all that much about. At the same time, the nomination process is to some extent an inside game. If, as the HuffPost story claims, Klobuchar has trouble recruiting the layers of highly talented staffers that the other candidates have because of a reputation (well-earned or not) for being an abusive boss, that will hurt her. It will hurt her more if it signifies a general wariness about Klobuchar among Washington insiders, which could yield fewer endorsements and less willingness by “party elites” to rally around her if the field has been winnowed down to two or three candidates. So I’ll be looking to whether Klobuchar is able to gather a few endorsements in the early stages of her campaign, especially from outside of Minnesota. There’s an extent to which a measured amount of pushback from Beltway elites could play into Klobuchar’s brand as a tough, no-BS outsider. But it’s really hard to go it completely alone in the primary, especially when your strategy involves winning over one faction of the party first (the beer track) and then building bridges to the other factions later on.